Natalie graduated from Florida International University where she received a Doctorate in Physical Therapy. After graduating from school she specialized in orthopedics and completed the Orthopedic Residency Program with Therapeutic Associates. Through her residency she took extensive course work through the North American Institute of Orthopedic Manual Therapy (NAIOMT), received 120 hours of mentorship from industry-recognized physical therapists, and completed a project on neuromuscular segmental rolling for athletes. After finishing the residency she sat for the Orthopedic Clinical Specialist (OCS) board exam and passed in June of 2016. Natalie is passionate about physical therapy and strives to help her patients move better and get stronger. She does her best to utilize up to date evidence based medicine and continues to take courses to increase her skill set. Natalie is also a coach and personal trainer at StrengthFarm Performance. She coaches a weekly mobility/stability class, and works with young female athletes for the sports performance program. 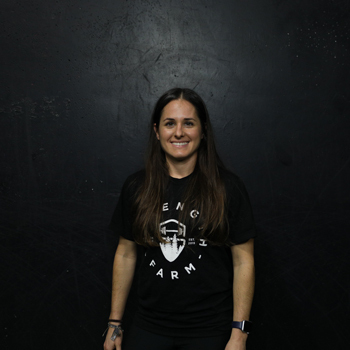 On her spare time, you can find Natalie working out at StrengthFarm, playing indoor soccer, or hiking. She is a health and wellness enthusiast and encourages everyone to participate in some form of exercise to stay healthy and STRONG. A: I train because I want to stay strong, agile, and healthy. I try my best to apply a variety of strength and endurance routines to help prevent injury. It also just makes me happy! A: Front squat: this is probably one of the most functional movements we do in the gym. It allows you to get a full depth squat and also mimics holding and picking up objects. If you keep working on this movement, it will help prevent back injuries when you have a yard work day, or need to help a friend move to a new apartment. It’s also a great way to keep your hip joints healthy. Consistently working on this movement will build a strong back and hips, which can carry over to everyday activities, such as doing yard work or helping a friend move to a new apartment. A: To me, exercise comes first. It not only makes me feel good physically, but mentally. It’s how I manage my stress and get a good night’s sleep (you don’t want to see me after a bad night’s sleep). My diet helps support my exercise. If I eat something “unhealthy”, I usually feel it later on or the next day during my workout. Because of this, I try to balance healthy eating without feeling like I’m limiting myself psychologically. I typically try to regulate the amount of gluten, sugar, and fried food I consume, while making sure I get some sort of greens in my diet. A: I like to draw and paint. It’s how I meditate and think.